Mini Measure Shot Glass, $2.97 (on sale now) - My mom got me one of these last year for christmas and I seriously don't know how I lived without it. I literally use it 365 days a year, usually multiple times a day. For baking and cooking this thing is a gem. Microplane Zester, $12.38 - This is an absolute necessity for any cook. It zests citrus like a breeze, finely grates parmigiano reggiano into pillowy piles, grates tough ginger, and even zests dark chocolate for topping desserts. The blades are super sharp so you don't have to work hard to grate food. Every kitchen needs one. Provencal Stonewall Salt Crock, $12.95 - Nate got me this salt crock for Christmas last year and I love it. It's a small detail that's really improved the efficiency of my kitchen. Having it filled next to the stove makes grabbing a pinch of salt at a moment's notice so easy and it's perfect for dunking my measuring spoons in for baking. Also it's pretty and french. 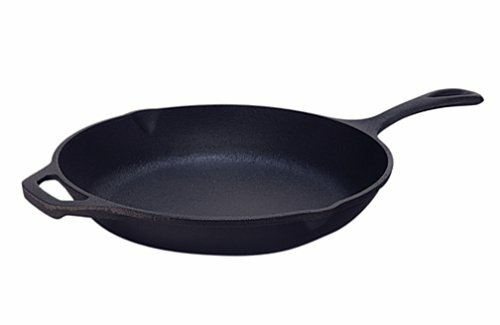 10" Lodge Cast Iron Skillet, $14.97 - Lodge skillets are made in the USA, affordable, reliable, and ever so necessary for every kitchen. We love cooking in cast iron. Cast iron gives great heat distribution, gets super hot for frying, and it easily works on the stove top, in the oven, and over a camp fire. So versatile. We make cornbread in it, fry eggplant, bake puffy pancakes, and latkes. We have a mini one which makes the perfect fried eggs as well as giant chocolate chip cookies for two. Silicone Baking Mats, $15.12 for two - I got these for Christmas last year and use them all the time. You'll never have to buy parchment paper or cooking oil again. Nothing sticks to these, and they make clean up a breeze. They are essential for cookies or baked goods of any kind. Chef'n Citrus Juicer, $23.08 - I put off buying this juicer for years. Somehow I just couldn't justify spending almost $25 for something as silly as a juice press. I finally splurged a couple months ago, and I use this thing every single day. It squeezes out every last bit of juice with just a gentle squeeze. It produces zero mess and is easy to clean. I'll never go back to anything else. Non-slip Epicurean Cutting Boards, $24.99 - $39.99 - These cutting boards are fantastic. We have them in three sizes; they are high-quality, non-slip, and dishwasher safe. These boards won't dull your knives, and the best thing about them is they require zero maintenance. One good cutting board and a good chef's knife are probably the two most important things in a kitchen, period. 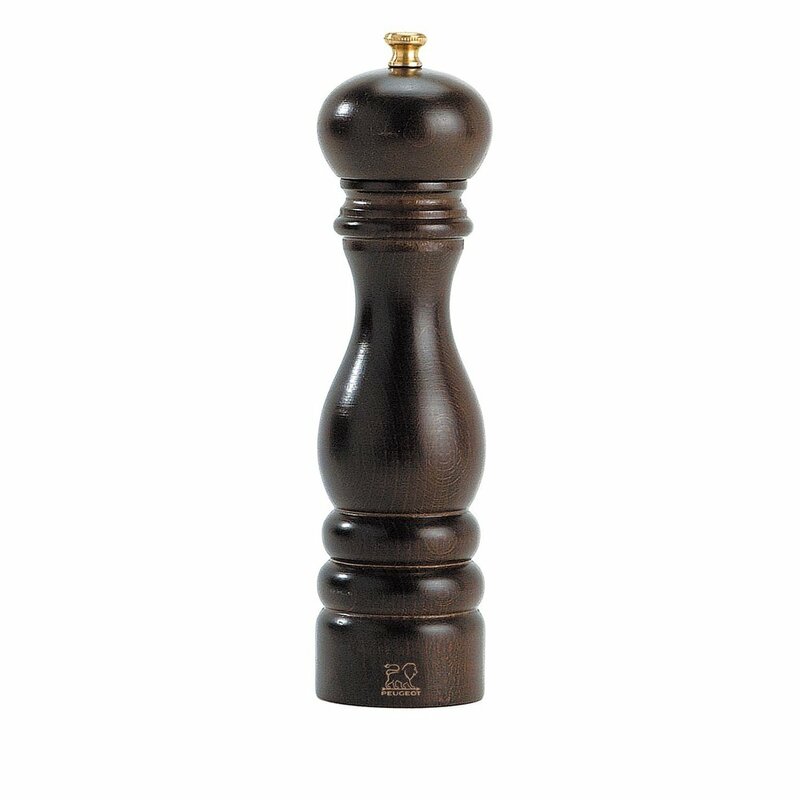 Peugeot 7-inch Salt & Pepper Mills, Chocolate, $36.99 each - We bought these with money from our wedding about two years ago and love them. They are a great investment, really high quality and will last a lifetime. They live next to our stove and are used daily. The dark chocolate color is so classic and looks sophisticated and timeless on the table. Marble Pastry Board, $44.95 - Although it's definitely not a necessity, I adore this pastry board. It lives on top of two of my burners, which provides much appreciated extra counter space. It's beautiful, sturdy, and perfect for the baker in your life. I never have to worry about clearing a space on the counter to roll out dough, I just toss some flour on this board and start rolling. This size fits perfectly in my fridge, which matters, because technically you want to have the option to pop it in there - you know, to keep those beautiful chunks of butter from melting in your pie crusts. Also, if you're into instagraming your culinary creations like I am, it makes the perfect background - no one will know you don't have fancy marble countertops! 9-cup Cuisinart Food Processor, $149 - I use my food processor probably 3-5 times a week for everything from pureeing chickpeas for hummus and pulsing ingredients for falafel. It's essential for pie crust. The attachments grate cheese in seconds, shred potatoes for latkes, and zucchini for zucchini bread. I don't know how I functioned before I owned a food processor. Advantage Components Pot Rack, $219 - I invested in this pot rack last summer because I found our pots and pans were getting scratched up after being shoved in a cabinet. They were also taking up precious storage space in our tiny kitchen. At the time, my husband thought it was a totally unnecessary purchase but after having it for almost two years even he admits our kitchen couldn't function without it. It's an easy way to create extra storage in a tight kitchen, it looks nice, and it doubles as a drying rack - just wash and hang! This particular one is expandable, so if one day we have a big kitchen we can expand it wider to fit the space. Le Creuset Dutch Ovens, $240 - $330 I am fortunate enough to have two of these beauties and I must say they are hands down my favorite thing about my kitchen. French-made, they are a gift that can be passed down generation after generation. If well-maintained, they will last forever. They are made of heavy duty cast iron so you get the even heat distribution and versatility of going from the stove to the oven to the table, but because of the enamel coating they require zero maintenance and are a breeze to clean. They are perfect for slow cooking, braising, frying, soups, and one pot meals. The moment the seasons change in the Fall, my Le Crueset makes its home almost permanently out on my stovetop. On top of all of this, the colors are gorgeous. I just splurged on a 3.5 quart in burgundy which is perfect for one pot meals for 2-4, cooking beans, hot chocolate, baked apples, or mulling cider and wine. I've had a 7.25 quart in Marseille which is a work horse - perfect for soup and stews, and large one pot meals. These make an incredible gift for any cook.